Tarot, Hand and I-Ging readings have been used for centuries to help an individual at a time that they feel stuck, lost or unsure of what they’re role in this life is. All three are used when an individual is confused, has questions and needs direction. They clarify decisions and give guidance along ones path of life. Since an early age Satprem has had visions and fine tuned her psychic abilities. She channels, sees pictures and receives messages. She has never studied either of these arts, as it is not something you can learn out of a book. 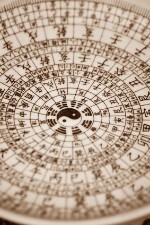 I Ging is a 3000 year old book of wisdom, also called the book of changes, and the Chinese philosophy of Taoism and Confucianism have rooted from this. In China and Japan “normal people”, the general public, politicians, businessmen etc go to I Ging “Oracle readers” for guidance about their future. To be able to interpret the 64 signs with the text in the I Ging one needs to dive deeply into Asian culture and thinking. The process is very complex and takes about 3 hours while reader and questioner have to stay in a silent contact. I work with the I Ging since my early youth. It was fashionable in the avant garde and intellectual circles around the 50s to discuss China and Asia in general and to learn from its ancient wisdom. This was combined with the studies of herbal medicines, acupuncture, martial arts, fine pottery, zen, Taoism and the works of Lao Tse etc. The I Ging was well known and to “play” with it was not unusual. I fell for the magic book and had enough curious friends who wanted a reading. After 40 years I still give I Ging readings occasionally. In India it is not unusual to visit a hand reader before making any important life-decision about anything like marriage, children, work, property etc. Even politicians consult their “family” palmist, Astrologer and Tarot reader before making any important and/or difficult decisions. Mostly the gift is inherited or “passed on” in a family from parent to child. When I came from the West to India for the first time 35 years ago I was skeptical about anything like palm reading but was also open minded. I had never read about it, and had no interest to study hands and their lines. Many years ago I was sitting at the Ganga in Varanassi when a Brahmin approached me and asked me to read his hands. I laughed and asked if this was a new way to get in contact with Western ladies and that I did not know how to do this. He was shy but insistent. Knowing that I did not know anything I relaxed, noted the delicate hand and gave in to the game. The moment I held his hand I felt a shift of energies as if in a trance but completely alert. My breath changed as pictures, scenes and stories developed in front of me and began speaking “out of me”. It was only a short encounter as he stopped me and said he knew I had “the gift”. He then told me that he himself was a known reader and that Palmistry was carried through his family line. I was curious to know how he could “read me” as he had approached me from several meters away. He replied, ‘it is written on your forehead’, but he did not want to tell me what the “signs” or “lines” were that he read. He then told me that I have to make use of this gift. Since then I have watchfully played with hand readings and discovered to my surprise that all readings were different. Some hands read only matters of health, others relations, others again were mixed and there were some readings which only addressed a persons spirituality/spiritual path. The more I became at ease with reading the more it developed. At one point I got charts which explained the lines in a hand. I tried to incorporate it but it never felt right or natural. Eventually I gave the charts away. I still don’t “know” anything about hand-reading, but am approached by more and more people who are sent by those who already had a reading. When the client is silent (not in the mind) her/his real questions come up from the sub consciousness and beyond. Many come back over the years and tell me that most of what “spoke out of me” happened, helped to avoid calamities and to redirect their lives. Tarot cards are an ancient system of wisdom which were developed, used and transmitted through different mystery schools in the Orient and kept secret for some time. The cards depicted symbols from the kabala, astrology, the elements and symbols of other mystery schools which much later in Europe were woven into pictures from the then “day to day” realities of rulers, knights, ladies, peasants, priests etc. They were used by seers as a kind of wisdom book much like I Ging. Around the 14th century Gypsies came to Europe from the East and used normal playing cards to do readings. This kind of activity and the Gypsies themselves were condemned by the church. Therefore readings were done in secret. Not everyone was a gifted reader but slowly the cards found their way into “normal” hands. From the 19th Century more Tarot decks were created, which climaxed with the rise of the New Age. The Rider-Waite and Crowley deck are mostly known and used by readers. Both belonged to different mystery schools of wisdom in England. With the New Age less complicated and more playful decks were created. 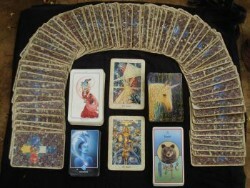 Over 30years ago I had seen different Tarot decks and even had readings, but I did not really trust in their meaning. It was the stories around them and the pictures of the different decks that attracted me. There were classes in the Pune Ashram where one could learn about tarot reading but they did not attract my curiosity. After I asked Osho (my Master) what work I could do in the Mystery School he told me to do Tarot readings in the pyramids of the Ashram. I was shocked at first and felt embarrassed because I had completed many other courses which I considered to be more “valid” and because I knew nothing about Tarot. I took it as a device and surrendered to it. I spoke to an Italian Tarot reader from the mystery school who suggested to try a reading on him. During that “reading” I simply followed my insights, using no particular technique or placing of the cards and listened to the inner voice. My “victim” was convinced with the outcome. He entrusted that I had seen much truth about him and he would follow the advice from the reading. He gave me my first Tarot deck, the Crowley cards. From this I found out that a reader should not buy their own cards but that they should “come” to oneself. I have worked 20 years with the Tarot and in the meantime developed my own reading art. It became more of a channeling than a reading from the mind or books. I work with different decks according to the person and situation. Mostly I “use” Crowley –cards for their deep symbolism, rich pictures and colors .I love to work with several decks from the mystery school of Osho, the Unicorn cards, a Native American animal-deck and I try out the energies of other decks which “speak” to me. For my readings the person first has to be silent for which I have developed and teach a breathing technique. It works quickly for those who trust and listen. The reading begins after the other sits with closed eyes and breathes her/himself into deeper silence. Again, this silence allows questions to come up from another source than the mind. I prefer to combine a Tarot reading with a hand reading as I can then verify the messages out of the hands with the stories the cards communicate. It astonishes how they correspond with each other and how deep and profound the readings are. Simultaneously energies of healing are created so that the client feels refreshed and renewed. As a result many wish to do more work with me. Many of my students met me through a reading which opened their interest to learn more about themselves. Before I take a student in to learn self-healing I always work out her/his growth-, being- and personality-card. It helps with my further work and decisions that need to be made. I also use Tarot cards with kabala and numerology to find the card that speaks about the student and me, our work together and what needs to be done. I “know” nothing! I started with I Ging at an early age, a palmist told me I have the gift of Hand reading and Osho encouraged me to read Tarot cards. Since then I have been doing readings for those who need some guidance and questions answered. I function as a channel; receive visions, pictures and messages.